Artistic Director of the ArtBoom Festival. Art historian, curator, essayist and co-ordinator of exhibitions, Works in co-operation with the East Art Foundation. Assistant at the Starmarch Gallery in Krakow (1997-2002), currently curator of Art agenda Nova in Krakow and the journal Video Now. Works to promote the most interesting phenomena in young Polish art which refer to contemporary realities, new media art, and conceptual art. Recipient of the Honoris Gratia award from the President of the City of Krakow for service in the field of culture and the arts (2007). Along with Marcin Gołębiewski is one of the progenitors of the ArtBoom Festival. 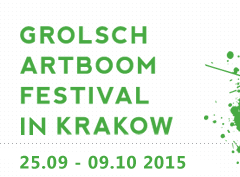 The Grolsch ArtBoom Visual Arts Festival is the largest event presenting art in the public space in Krakow. It is interdisciplinary and international in nature ― projects combine contemporary art, performance and happenings with music and social activities. Thanks to the Grolsch ArtBoom Festival, works of artists such as: Jenny Holzer, Mirosław Bałka, Paweł Althamer, Pipilotti Rist, Roman Signer, Joanna Rajkowska, Robert Kuśmirowski or BLU have appeared in Krakow’s public space. The elements that make up the substantially consistent programme of the Festival are site-specific projects, carried out by invited artists, curators and activists, closely related to the specificity of various spaces of the city of Krakow, as well as the programme of activities, performances, meetings and discussions concerning art in the public space and its social dimension. The Festival’s principles include social and community activities inspired by artists, and cooperation with people interested in improving the quality of the city’s public space as well as discussions and meetings enabling the development of a comprehensive concept of action for subsequent editions. Conferences and debates of an educational nature aim at sensitising people to the issues related to the urban space and activating the interested parties. Thanks to the concept of the Fresh Zone competition, the programme of the Festival also includes projects of the most promising students of art schools from across Poland. The purpose of meetings with artists and activists is to introduce children and young people to the most important aspects of contemporary art and its role in the public space. Projects completed during the Festival – sculptures, objects, installations, murals and activities of an ephemeral, happening nature – all contribute to the comprehensive accomplishment of the Festival’s aims. The Miastoprojektor (CityDesigner) concept of cyclical meetings with the city’s residents, architects, students and all those interested in the life of the city help to create a picture of necessary changes in the city, locate run-down areas and stimulate residents into action. The results of these debates and discussions may be used later to carry out selected ideas, for urban planning or transport reforms in the city, and may live on beyond the Grolsch ArtBoom Festival. The concept of the Festival and its separation from other events is based on presenting the best practices in public art. People involved in programming the Festival are curators from all over Poland, with extensive experience in the area of public art. Seeking social participation in the event and widening the circle of art audiences, we try to create a coherent programme comprising the most authentic expressions. We are interested in the well-founded presence of art in the public space, co-existence and readiness to include contemporary art in the social discourse on equal terms. We want to emphasize the unifying role of art and the possibility for the residents to identify with certain places through art by means of activities based on interventions of various kinds. The Festival takes place in the urban spaces of the City of Krakow, interacting with those spaces and prompting passers-by to reflect on reality. The exceptional nature of the festival is also a result of the fact that some of the works presented at the festival will become part of the collection of the National Museum in Krakow, and others will permanently remain in public spaces of the city.